General Ledger Budgeting and Sales Analysis Targets with ERP software outlines an organization's planned sales and expenditures for a given time period based on their expected performance. Projected targets against Customers, Product Classes or user-defined Sales History Targets, enable sales people and management to project future sales from a number of angles. Performance and Achievement reports can be printed to enable comparisons between actual and projected targets. Assist in establishing Sales Targets, the system projects forecasts based on the past sales and integrated algorithms. The General Ledger System allows for current year budgets, next year budgets and 8 alternate budgets. General Ledger budgets can be posted to each individual period, or a fixed amount spread evenly across all periods, or a fixed amount spread across all periods based on the defined budget spread. Budgets can also be copied from one budget to another and a % increase applied. 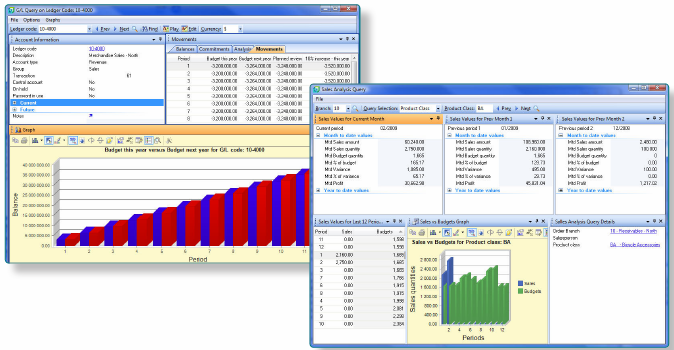 Sales Analysis Targets establish baseline product and product-class levels (dollars/quantity) for comparative analytics. General Ledger Commitment Accounting is a financial management tool which established expenditure thresholds across defined ledger accounts managing spending limits. When combining General Ledger budgets, Sales Analysis Targets and General Ledger Commitment Accounting, these tools give you performance-based financial analysis using your daily transactional activities. If you are interested in looking more deeply into Budgeting and Targets with award winning ERP software, download the fact sheet now.